Sometimes the best meals are the simplest. This has just 6 ingredients and you likely have everything in your kitchen. 2 lb baby red potatoes cut into 1" pieces, quartered or into 1/8'ths if larger. 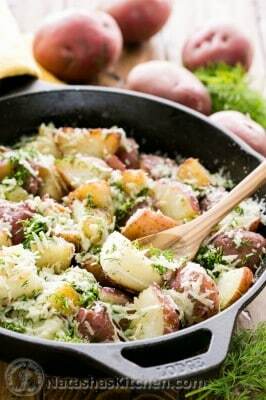 Fill a medium pot with cut potatoes and add warm water until there is 1/2" of water above the top of the potatoes. Stir in 1 tsp salt. Cover and bring to a boil and cook red potatoes at a light boil for about 10-12 min in salted water or until you can smoothly pierce potatoes with a fork. Remove from heat and drain well.